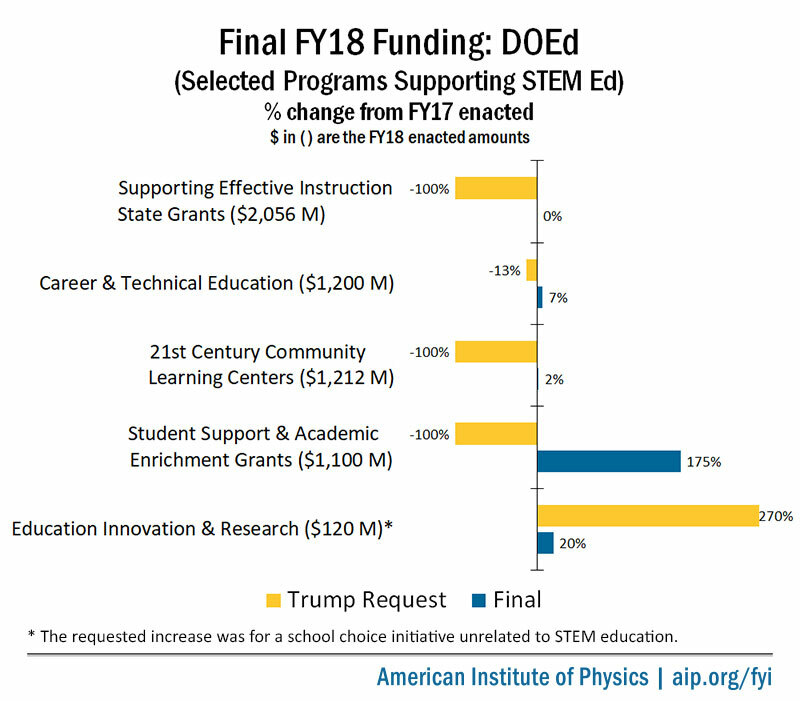 The final spending legislation for fiscal year 2018 provides at least steady funding to most STEM education programs across the federal government, rejecting the deep cuts the Trump administration proposed. 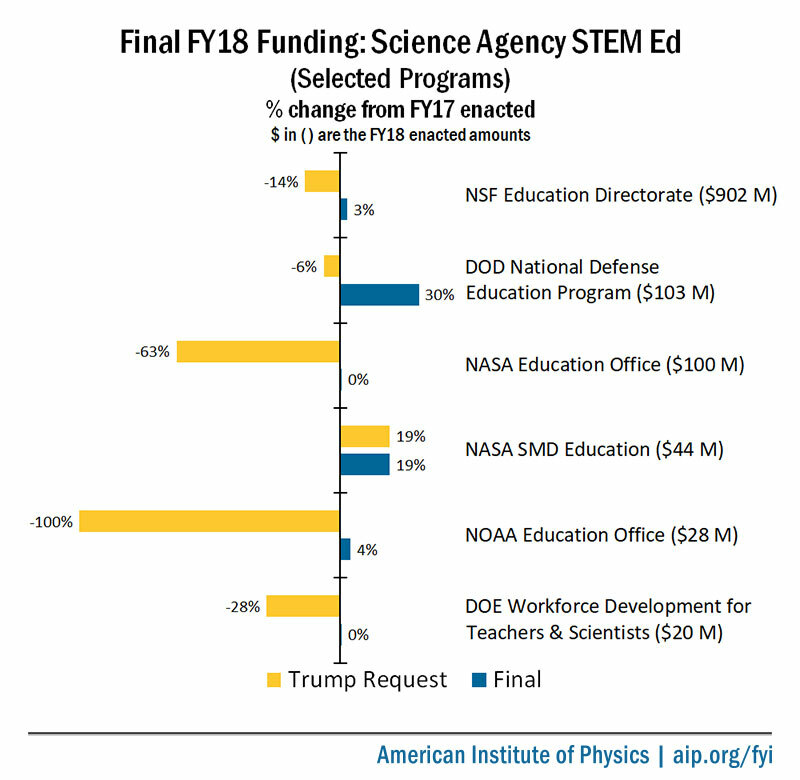 The final appropriations law for fiscal year 2018 rebuffs the deep funding cuts that the Trump administration has proposed for federal STEM education programs. Congress instead provides flat funding or greater for most STEM education programs at science-funding agencies and preserves several Department of Education grant programs that states and districts can use to support STEM education. The following charts summarize the funding outcomes for a selection of major programs. Additional details on these and other programs are provided below. The text of the final appropriations law is available here. Unless otherwise noted in the joint House-Senate explanatory statement accompanying the law, which provides additional funding details and policy guidance, language in the House and Senate Appropriations Committee reports carries the same weight as the statement itself. Detailed tables with funding amounts by account and links to the relevant sections of the statement are available in FYI’s Federal Science Budget Tracker. Termination of major state grant programs rejected. Congress flatly rejects the administration’s proposal to eliminate funding for three major DOEd grant programs authorized by the Every Student Succeeds Act (ESSA) that states and districts can use to support STEM initiatives, among other activities. Of the three programs, the largest boost is for the Student Support and Academic Enrichment Grants (SSAEG) program, which supports efforts such as improving STEM courses and establishing STEM-focused specialty schools. The statement specifies a $700 million increase for SSAEG that nearly triples the program’s budget to $1.1 billion, which is still short of the $1.6 billion authorized by ESSA for the program for fiscal year 2018. Funding for the Supporting Effective Instruction State Grants program, which can be used to support educator professional development programs in STEM, will remain steady at $2.1 billion. The 21st Century Community Learning Centers program, which can be used to establish centers that provide STEM enrichment programs and activities to students during non-school hours, will see a 2 percent increase to $1.2 billion, $100 million above the level authorized by ESSA. New funding dedicated to innovative STEM projects. The budget for the Education Innovation and Research (EIR) program is increasing 20 percent to $120 million. The program provides grants to states to support the replication and scaling-up of evidence-based solutions to persistent challenges in education. The statement specifies that $50 million go toward supporting “innovative STEM education projects, including computer science education” and notes that Congress will consider the administration’s fiscal year 2019 request to dedicate all EIR funds to STEM education projects in the next budget cycle. Career and technical education budget rising. Funding for DOEd’s Career and Technical Education (CTE) program is rising 7 percent to $1.2 billion. The administration has proposed additional increases to the CTE program in its fiscal year 2019 request, and both Congress and the administration have shown increasing interest in the role of CTE programs in expanding the nation’s technical workforce. STEM diversity program sees increase. The budget for the Minority Science and Engineering Improvement Program is increasing 14 percent to $11 million. The program provides funds to predominantly minority-serving institutions to eliminate or reduce barriers for underrepresented communities to enter STEM fields. The House report more broadly encourages DOEd to enhance its efforts to increase diversity in STEM by supporting small and disadvantaged businesses, minority serving institutions, and underserved communities. It also expresses support for investments in STEM internships and training at the K–12 and post-secondary education levels. Funding for the NSF’s Education and Human Resources Directorate (EHR) is set to increase 3 percent to $902 million. Scholarships and fellowships protected from cuts. The Senate report rejects the administration’s proposal to reduce funding for the Graduate Research Fellowship Program. The administration proposed halving the number of new awards to 1,000. The statement specifies a 6 percent increase in funding for the Robert Noyce Teacher Scholarship Program, which provides support for STEM professionals to become teachers, bringing its budget to $65 million. Advanced Technological Education funding maintained. Both the House and Senate reports reject the administration’s proposed 11 percent cut for the $66 million Advanced Technological Education (ATE) program, instead specifying it should be funded at no less than the current amount. The National Science Board has identified ATE, which supports CTE programs in high-demand science and engineering fields, as part of NSF’s efforts to address the needs of a growing U.S. STEM workforce. Hispanic Serving Institutions program doubled. The statement specifies $30 million for the HSI program, double the amount appropriated last year. Broadening participation programs fully funded. Congress rejects the administration’s proposed cuts to the $46 million Louis Stokes Alliances for Minority Participation and $14 million Tribal Colleges and Universities Program, opting to maintain current funding levels. The statement also provides the requested $35 million for the Historically Black Colleges and Universities Undergraduate Program. Education Office elimination rejected. NASA’s Office of Education, which the Trump administration proposed to eliminate, is receiving level funding at $100 million. The office funds the Space Grant College and Fellowship Program, Minority University and Research Education Program, and STEM Education and Accountability Projects. Science Mission Directorate education activities boosted. Both the House and Senate reports specify that the Science Mission Directorate budget for education and outreach should rise from $37 million to $44 million. Office of Science workforce development program fully funded. The statement maintains the current $20 million funding level for the DOE Office of Science’s Workforce Development for Teachers and Scientists program. The Senate report directs continued funding for the $1.2 million Albert Einstein Distinguished Educator Fellowship Program, which places K–12 STEM educators in federal science agencies and congressional offices. National Defense Education Program ramps up with focus on manufacturing. Funding for the National Defense Education Program is increasing 30 percent to $103 million. Within that amount, $29 million is specified as an increase for manufacturing initiatives. The program aims to develop STEM talent through scholarships, fellowships, and support for STEM engagement opportunities at schools near DOD facilities. Minority-serving institutions support climbing. DOD support for Historically Black Colleges and Universities and for other minority-serving educational institutions is increasing by 19 percent to $40 million, matching the amount authorized in the most recent National Defense Authorization Act. Education office elimination rejected. The statement rejects the administration’s proposal to eliminate NOAA’s $27 million Office of Education, instead specifying a $1 million increase directed toward the Education Partnership Program with Minority Serving Institutions.